I am presenting a class on April 4th 2019 at 6 PM at the Borrego Springs library. The class is an introduction to digital recording. Several sections will be posted here, and links to software. All the software listed is professional and reputable as far as I know, but I am not responsible for any damages incurred on your systems. Audio is produced by the air being alternately compressed and released by something vibrating or moving. The first recordings were made by taking this motion and using it to move a needle that was placed over a rotating wax cylinder. The needle’s motions made grooves in the wax. In order to play the recording, the needle was placed in the wax groove and it’s motion was directed to a large horn that amplified the sound. No electricity was needed, as the cylinders rotation was spring powered. The early audio recordings were mono only, a single audio channel. Vinyl Records eliminated the cylinder, and AC power eliminated the spring and added an amplifier for louder sound. Copies were made by making literal casts of the recording and pressing it onto warm vinyl. Multiple microphones allowed an audio engineer to control the volume of the various instruments or voices during a performance. Electronic recording began with Magnetic wire recorders, which were created and used in an office environments for use by executives. A fluctuating magnetic field magnetized the wire as it moved past the recording head. Music was a secondary concern. Steel wire was a challenge to use and store, so eventually a long strip of plastic, coated with iron oxide was introduced. Recording tape has been gradually improved since its introduction. Stereo recording added 2 channels, left and right. This was a vast improvement on the original mono recordings, a path which eventually led to the now abandoned QUAD recordings, and eventually to the 6 channel 5.1 recording format used for DVD now. Other multi channel formats exist. Multi track tape recorders in studios enabled multiple tracks of high quality audio. The machines eventually expanded in size up to a whopping 48 tracks on 2” wide tape. 2 machines were synchronized together for even more tracks. These wonderful behemoths held sway in the studio when I entered the industry. They were great, but very technically demanding. The electronics for each track had to be adjusted for volume and for frequency, so each track sounded the same. All the audio still ended up on just 2 tracks of vinyl records however. Mixing boards expanded to match the track count of the recorders.Outboard effects such as reverb, delay, compressors, equalizers, and more could easily be used on individual tracks. This added a LOT of creative control to the musicians and the audio engineers. Cassette players gave consumers the ability to record their own music at last, and many a budget minded musician recorded their own performances, or mix tapes of their favorite music. 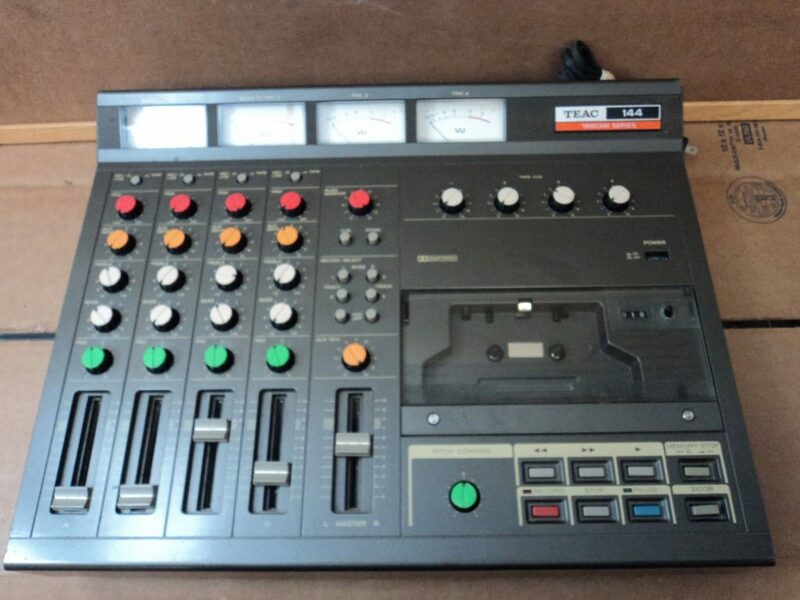 Multi track cassettes added a multi track capability for consumers, although their limited bandwidth made them more of a vehicle for creating demos, to be re-recorded in a “real” studio. Instead of mechanically recording sound, or recording a fluctuating magnetic field, digital recording slices a sound into thousands of sections and represents each slice with a number. The bit rate is the number of slices per second. Standard CD audio is sliced into 44.1 thousand numbers per second. This is the bit rate. The range of numbers is the bit depth. CDs have a 16 bit depth, which translates to 65,536 possible values. Generally this standard range is perfectly adequate, and using this standard ensures your music is compatible with most uses. In studios engineers can use higher rates. An analogue signal (in red) encoded to 4-bit PCM digital samples (in blue); the bit depth is four, so each sample’s amplitude is one of 16 possible values. A graphic that showed the 44.1 bit rate would have 44,100 vertical lines, and 65,536 horizontal lines. It would be hard to see the audio through the lines! Once audio is recorded it can be saved in a bewildering variety of digital file formats. In addition to various bit rates and depths, audio can be mono, stereo or even multi channel. The file type is always placed at the end of the file name. Its important to know what kind of audio files you will need for your specific purpose. 1. Wave files are very high quality, and end in .WAV. 2. AIF is mostly used for Apple systems, and is a very high quality. AIF files end in .AIF . 3. The Ogg Vorbis format is completely lossless, but partly because of the large files sizes is seldom used. These end in .OGG. 4. MP3 the MP3 format has a reduced bit rate, depth and size. It is considered a “lossly” format, (not a lousy one!) because it loses some of the higher frequency audio considered by some to be unnoticeable. This is still hotly debated. The MP3 format reduces the bit rate and consequently the range of audio, literally throwing away the higher frequencies. This greatly reduces the size of the MP3 files, allowing larger quantities of audio to be stored on devices, and eases transmission on the internet. This was more important in the early days of the internet before high speed and larger storage devices were common. Early conversions to MP3 were not of a high quality, giving MP3 a bad name. This has been largely resolved, but I still recommend using a higher quality format for mix down and distribution wherever possible. Youtube, and other distribution mediums reduce the bit rate, but its best to give them a higher resolution to start with, lest the quality suffers. 5. MP4 are used for audio and video together. These end in .MP4. 6. M4Vv This is the format the files are in when purchased from Apple via iTunes. The file ends in .MV4. Most of the software I will be talking about ignores this copy protection, but this format generally prevents basic file sharing. For our purposes, we will be sticking to file format # 1, 44.1, 16 bit .WAV files. MIDI stands for Musical Instrument Digital Interface and was developed in the 1980s by a group of synthesizer manufacturers so that their equipment could communicate with each other. It uses a special round 5 pin connector or a USB connector. With MIDI, pressing a key on one synth can control another synthesizer. A computer can control a large number of synths, each playing a different part, making a whole ensemble of musical instruments. If you are not a keyboard player, MIDI is not as much use to you, however it is quite powerful and can vastly expand your sonic palette. Notes can also be entered one at a time in the editing mode, so it is not necessary to be a skilled keyboard player to create music with MIDI. VERY IMPORTANT: MIDI is NOT audio – yet. It only records which note is played, when, and how hard the note is struck. MIDI instruments also exist that can record performances with wind, string and percussion instruments. After a MIDI sequence is recorded it can be further manipulated, allowing control over playback speed, instrument type, and more. Let me be clear, this is NOT actual audio, but information that can be used to control musical instruments, similar to a piece of written music. MIDI files are literally list of numbers. Here is a sample of raw MIDI data. To make it even more fun, it is in Hexadecimal, AKA base 16. Don’t worry, the computer handles the tough math! Fortunately, the software we will be using can display the notes in a friendly piano roll or musical notes. 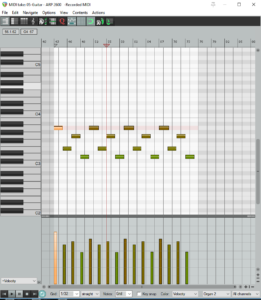 This example shows some MIDI notes in the “Piano Roll” format. The upper part of this illustration shows the notes, and the lower shows the velocity that the notes were struck with. All can be edited further by dragging them up or down to change the note, and left or right to change the time the note is played. Dragging the end of the note changes the length of the note. 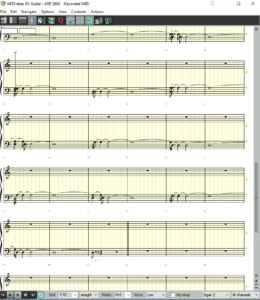 Here is a MIDI files shown as conventional music notation. There are also programs to control music notation very precisely. Since it is not audio yet, a MIDI file can be quickly changed to play a different type of instrument. MIDI can control many keyboards, and is also used to control software synths which are recreations of existing synths, and even creating sound not based on existing sounds at all. MIDI files can usually be played with a computers built in sounds, although this can be disappointing in the case of stock sound cards. Additional hardware or software can vastly improve the quality of MIDI file sounds. MIDI is even used to control lighting instruments. 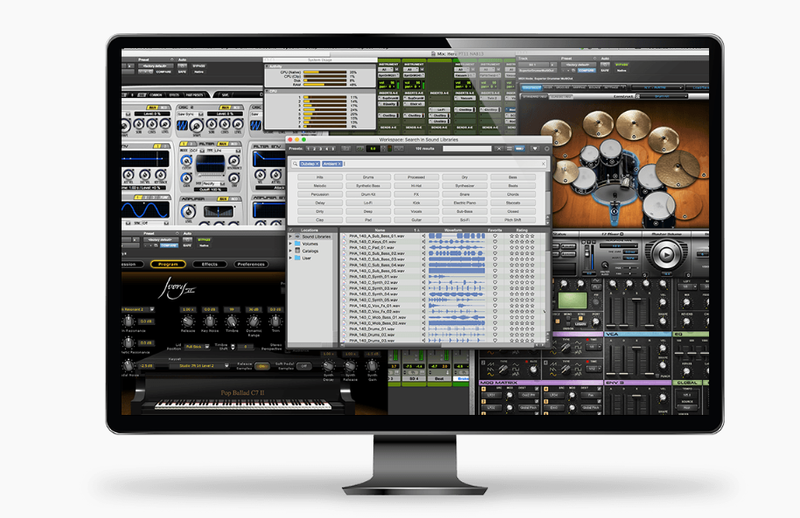 A DAW is your software tool for recording. There are lots of choices ranging from free to thousands of dollars. Some of them feature basic video editing also. All record MIDI also. 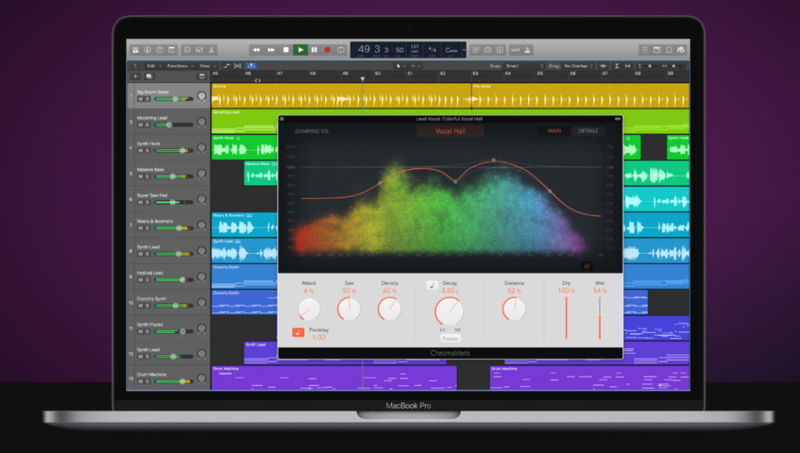 Protools, Cubase, Logic, Sonar, Garage Band, Reaper, Fruity Loops, are all very popular. Garage Band comes pre-installed on most Apple computers. It has a large number of built in instruments and can control external synthesizers. It is very easy to use, and Apple has regular classes teaching it. 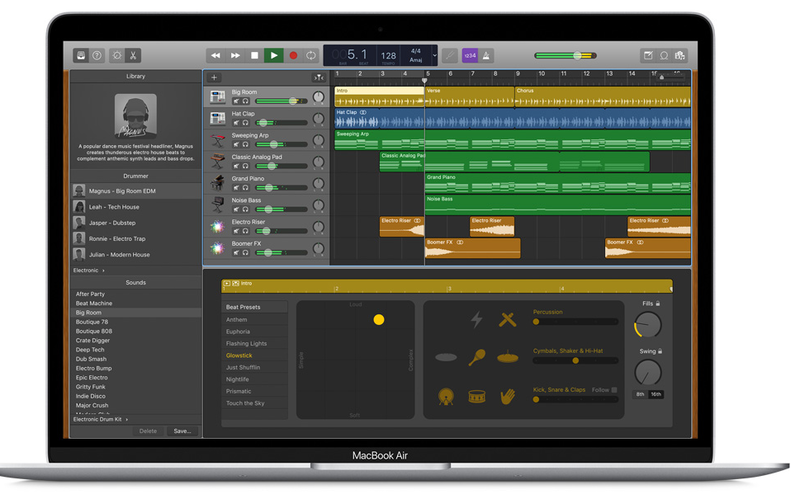 Logic is Apple only and is very solid, slightly more challenging than Garage Band, but more powerful. It has a powerful collection of additional instruments and effects. $300 to $1000 PER year. Protools is the professional standard, very commonly used in high end studios, and can be used with very expensive hardware. They have switched to a subscription based model, and it is currently $300 PER year for the basic version. 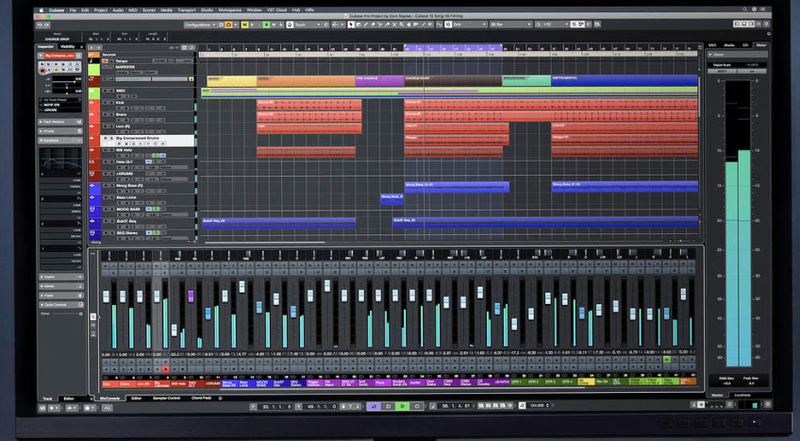 One nice feature is because it is used in the larger studios, a project created in Pro Tools can be taken from studio to studio easily, or from a home studio to a larger studio. There are ways to do this with other software too. 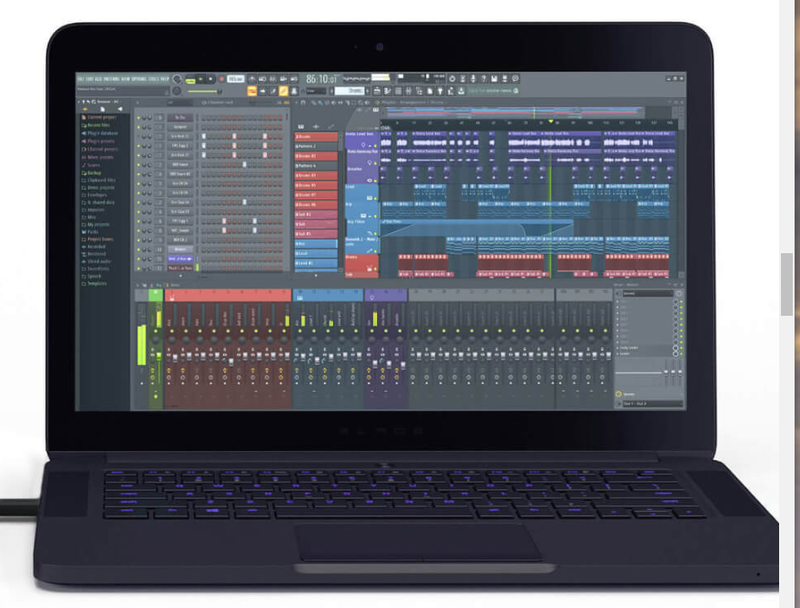 Fruity Loops, now called FL Studios is often used in hip hop and other beat or pattern based music types. It has a large number of add-ons, and features lifetime upgrades. It is available for Apple or PC. $199.00 basic, $900 for the pro version. $559 for the base version. 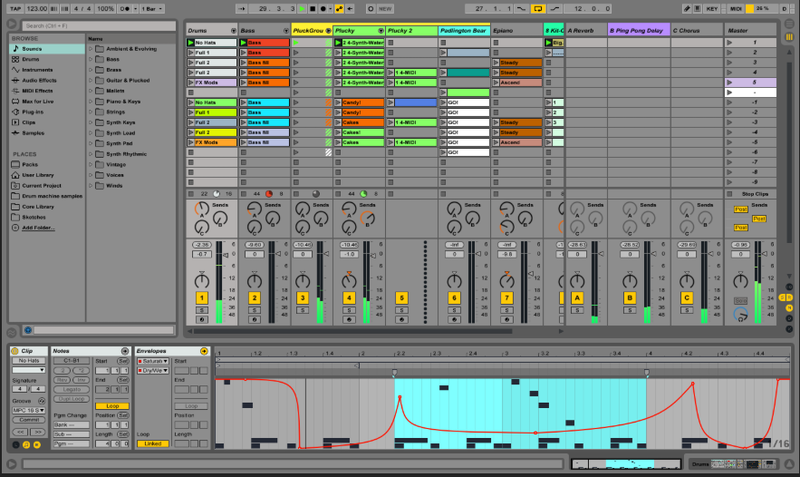 Ableton Live is quite powerful, with support for external instruments, MIDI, software synths and more. It appears to be aimed at loop based composers, but can be used for more traditional recording methods. Reaper offers all the features of audio, MIDI and even basic video editing. Runs on both Mac or PC. regular updates for a number of years. The demo version has no limitations, except for a “nag notice”. You can customize it extensively. This is my favorite DAW, and it’s purely coincidental that it’s the most inexpensive one! So many choices! I’ve used most of them, and seen them all improve through the years. How do you choose one over the other? Other than the Apple only Garage Band and Logic, all run on either platform. There are financial, musical and social reasons to choose one over the other. Groups of similarly minded musicians tend to use certain programs. For instance, many hip hop and rap artists choose FL Studio. If you are a techno musician I recommend Reason for its repetitive loop based work flow. It can be used to create other kinds of music. Other than that, let your budget and personal opinion decide. Most have free demo versions limited in one way or another so you can download it and try it out. I will focus on Reaper in the remaining section, although all of the concepts can be applied to any other DAW. The others can have specific features that might appeal to you more though. I have included the latest version of Reaper for Mac and PC in the CD, and the links above will take you to the various download sites for the other DAWs. While some audio can be recorded without additional hardware by using the tiny stereo 1/8 inch connectors built in to all computers, adding an audio interface dramatically adds to the capability and quality. Advances in computer speed and storage capacity allow modern systems to record multiple audio sources at once, not possible on the 1/8 connector. There are 2 main types of audio connectors. Microphones use the XLR type and are found mostly on microphones. Guitars and keyboards use ¼ connectors. These allow both types in one connector. 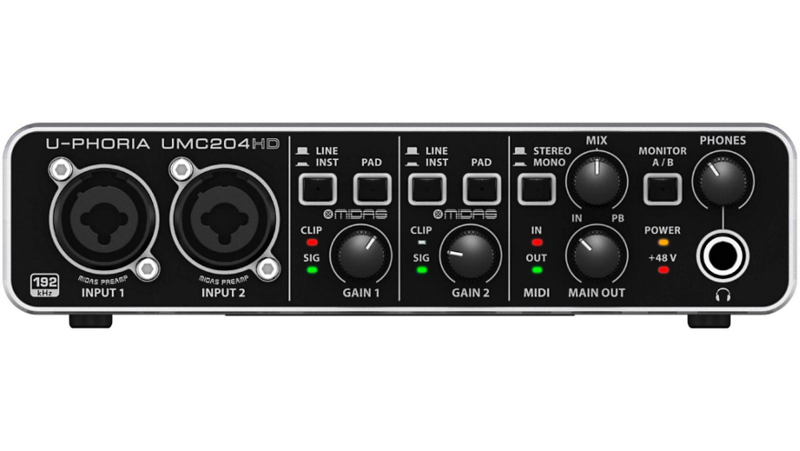 The basic 2 channel interface allows control over gain, input type, headphones and master volume. While USB microphones exist, I would not recommend them for any serious work as they tend to be quite noisy and can have latency, introducing an annoying delay into the sound. Modern interfaces allow the user to select between ¼ and XLR in the same connection. There is an button to choose LINE or XLR. In this case it is marked Inst ( for instrument). There is also a pad button, to reduce the volume by a fixed amount for certain types of instruments. Some microphones also require “Phantom Power”, which is 48 Volts for the more expensive condenser mics. There is also an adjustment to accommodate various audio levels, usually labeled Gain. The gain is adjusted to keep the level as high as possible, but still below the overloading level. In order to record more than 2 audio signals at once, a multi channel interface is needed. The connection between the computer and the audio interface is either USB, or Firewire. Older interfaces utilize a card plugged into the computer with special cables. Even if your interface is only 2 channels, you can still edit and mix more than just 2 channels, once recorded. The number of channels desired is the main factor affecting price. You will need to consider your work flow & plans. Just how many instruments do you need to record at one time? With multi tracking, you can add more tracks later, building a performance over time. Better interfaces offer more than just multiple inputs. There are options for fiber optic & digital inputs, multiple outputs for working in surround sound, and MIDI inputs. There can be more control over input volume, and they may even offer features that used to be only on high end mixers such as sending to external equipment, multiple head phone mixes, and more. What ever type you purchase, install the software supplied with it, or go to the manufacturers site and download the latest version. PCs often need adjustment with the drivers. See http://www.asio4all.org/ for an improved ASIO driver. As an example, my Focusrite Pro 40 interface has 10 analog inputs and 10 outputs. ADAT / fiber inputs from other equipment can bring this up to 20 inputs and outputs. There is also a stereo digital format called SPDIF. Each channel has phantom power, gain, and LED meters. I use the outputs to send my organ sound to a leslie speaker, the synthesizer to a delay unit, and the master volume to an LED volume indicator, and a power amp. It functions as a patch bay in my studio. Behringer UMC 204	stereo – $130. 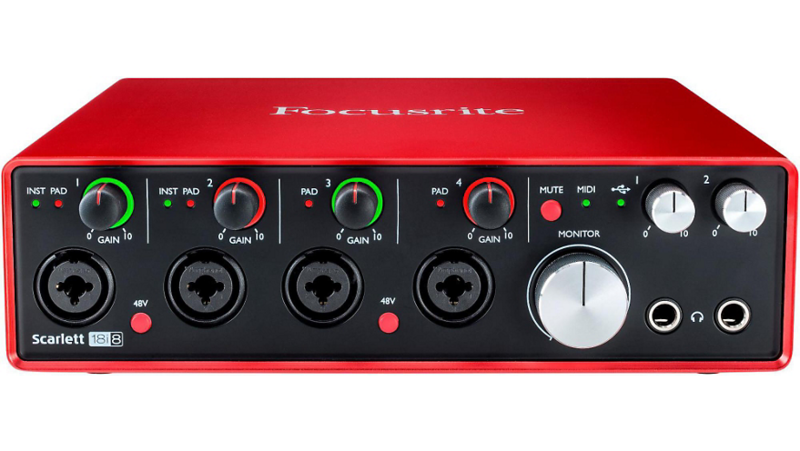 Focusrite 18i8 4 channel interface $380. 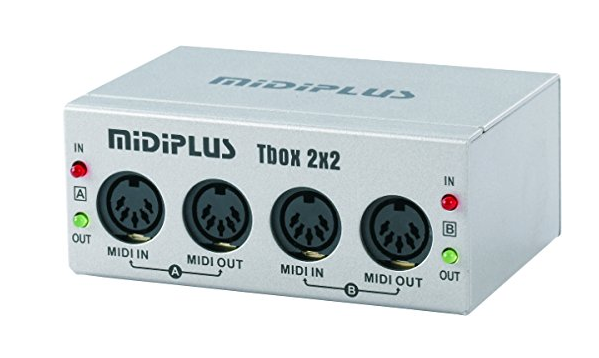 MIDI interfaces use a 5 pin DIN type connector to control older synthesizers. More modern keyboards use the USB interface type. Some have both, but only as a convenience, since only one is used at a time. Some graphics cards have MIDI built in, needing an additional cable. I should not leave the section on hardware without mentioning the importance of speakers! Good headphones are helpful, but try to get some quality studio monitor speakers that have a flat frequency response so that you can get an accurate idea of what your music sounds like. Inexpensive computer type speakers can seriously mislead you, as can the typical living room speakers. The computer needed for all this work does not have to be that powerful. I’ve used a Mac Mini for years, and also a Mac Air, both fairly low powered. Low end PC laptops can work also, but not a Chrome book or other internet based system. Since the demo is free, go ahead and install it and see. The main limiting factor in the amount of audio you can record and play at once is the computers CPU power and memory. I also recommended an external, or separate, dedicated hard drive. Audio files can be quite large. Recording onto the same drive as the operating system can cause problems. Always be sure you have researched the interfaces compatibility with your specific system before purchase. Plug ins are used frequently instead of external devices for manipulating audio. Reverb, delay, compression, equalization and much more can be applied to individual tracks. They can even be combined and arranged to affect each other as needed. Previously synthesizers and external devices were exclusively hardware based, and there are many fine examples. Recent improvements in computer performance have made it possible to emulate hardware synths entirely in software. These are usually called plug-ins, or VSTs, after the file names. They range from free to thousands of dollars. Some entirely create the audio from scratch, and some use samples triggered by the software. There are also majestic sounding (and very expensive) VSTs that produce incredible sounds, such as the Native Instrument series. Arturia makes amazing software synthesizers and good hardware too. Reaper is very easy to customize. In the view drop down selector, you can select between many options. The windows can be stretched out as needed. On the Reaper site you can get themes to make it look various ways and to augment its functions. The docker, mixer, and media explorer are what I usually use. The docker and mixer are 2 ways of viewing the same standard controls of volume, panning, transport control and input controls. As is standard in DAWs, there are buttons for MUTE marked (M), and SOLO marked (S). projects, saving, undo and redo. There is a metronome, an option for displaying a grid, and having the audio “snap” to that grid. This is the Media Explorer, handy for instantly listening to and adding audio to your track, and a Clock showing your choice of bars and beats, or minutes and seconds. The first step should always be to create a new project, create a folder, and save the project into your new folder. Recording without this step can place files all over the place as Reaper saves the recorded audio, possibly on the desktop. This is messy, and makes it difficult in many ways. Stay organized! The second important step is selecting the tempo for your music. Turn on the metronome by clicking the icon of a metronome, and then set the musics tempo. This will assist in editing later on. Tempo can be changed mid-song too. Tempo is in the lower center of the track window and its measured in BPM, or Beats Per Minute. Don’t confuse it with the RATE adjustment, which is just to the right of the BPM indicator. Click record in the transport area. Step 1. Track/insert new track. Step 2 Under the track name choose input type. This will vary depending on your audio interface & number of inputs. The picture shows stereo input choices – just left and right. Step 3 Arm recording on the track by clicking the button to the left of the track name section. It will turn RED, to inform you it is actually armed. Step 4 Toggle record monitoring ON. The symbol is supposed to be a little speaker. The speaker icon should be dark. If it is light and empty on the left side, record monitoring is OFF. A handy note appears to let you know its state when you hover the mouse over it. Step 5. At this point, while playing your instrument, adjust the gain dial on your audio interface so that it is as high as possible but does not go into overload. If it does, a red spot appears at the top of the volume section. The audio may be overloading the recorder and the quality might suffer. A small amount for a short time is usually OK, but use your ears. Digital distortion is unwanted and might permanently mar the recording. You may raise the OUTPUT volume (the silver bars) so you can hear your instrument during your performance, this does not affect the recording volume. This graphic shows some distortion in the signal, shown as red at the upper section of the volume indicator. Once you lower the gain, you can click the red part to eliminate the overload warning. Step 6 The record button is to the right of the pause button. It will turn red when you press it, and recording will start. You should see audio beginning the fill the right side. The other buttons in the transport section are the stop, play, go to start, and go to end. There is also a loop button (It looks like a recycle symbol). When the recording is finished, press the stop button or space bar. A window will appear with these options: Save All, Rename Selected, Delete Selected, or Delete All. If you like what you recorded, select the file or more than one and name them. If you don’t want to save it, either choose Delete All, or select the unwanted files and Delete Selected. The software assigns a file name, but you can rename it here. I highly recommend naming the track itself in the open section to the right of the Arm Record button. Tracks can also be added by simply dragging and dropping an audio file or a MIDI file to Reaper. Continue this process of adding tracks until you are happy with them. Don’t worry too much about the relative volumes at this point. Use the M to MUTE individual tracks (The M turns red), and the S to SOLO them ( the S turns yellow) as needed. Now you can begin the mixing process. In this stage of audio engineering you will adjust the volume, panning, EQ and add effects. This will vary depending on your audio interface & number of inputs. Once all the tracks are recorded the next step is adjusting their volumes, panning, and effects. The individual controls are adjusted as needed. If there is no change to those settings for the length of the material, you can move to the next step, but if you want some items to change over time, it’s the perfect place to use automation. Back in “the day” mixing was like a performance. An engineer had a script to follow, and as the song was mixed down to a separate tape machine, they carefully adjusted the track volumes and effects. Sometimes the job was too much, and several individuals followed along carefully making the adjustments needed on multiple tracks. Fortunately, those days are over. Modern DAWs have automation, allowing the engineer to make those adjustments and changes by creating changes over time called “Envelopes”. The automation allows precise control over all aspects of the recording. The button labeled “trim” displays the automation options. Left click the trim button to see this window. Control over the volume, panning, width, muting and more can be displayed as a line under the audio track. You can add points along the line by SHIFT left clicking to add a single line, or ALT clicking, to draw a more complex set of points. Volume envelope for vocal track 02 is shown here. Each point is created by holding the shift key, and clicking with the mouse. The points can be dragged into the desired position. Right clicking the trim button brings up this bewildering array of options. Don’t worry, you only need a few! You can choose to display volume, pan, mute and others. At the bottom is the track automation mode options. Choose “Read” to enable the automation you create to follow along and make the changes you created previously. You will see the controls moving as the music plays. There are many other automation MODE options. “Write” is the option that lets you move the faders and record your moves while the the music is playing, rather than clicking with a mouse. Here the automation was recorded by moving the fader while the music plays. There are many more data points created with this method. “Latch” mode only changes the envelopes once the fader is moved. This process can be done in steps for each of the possible options on every track. This sort of detailed control is both powerful and time consuming. It is not necessary to automate every parameter. If the volume is simply set with the fader instead, it will remain at that level for the rest of the piece. The track can be modified even after the audio is recorded though the application of effects. Reverb, echo, delay, equalization adjustments, dynamics and even full fledged synthesizers can be added to each track. Click the green button marked FX. An empty window will open. After you have added some effects they will be listed here, but at first it is empty. Click the Add button on the bottom left to open yet another window. This “add FX” window shows multiple effect categories. Many useful effects are supplied with Reaper, under the developers name “Cockos”. The effects can also be sorted by categories or developer. Some of these FX are even software synthesizers, full on instruments. There is a search filter at the bottom that makes it easy to find a certain type of effect. Entering “reverb”, for example, will only show reverbs. Be sure to clear the search filter after you use it, or you may not be able to find anything except the last type you searched for! Here I have added the reverb plug in named “ReaVerb” from Cockos. There are controls for the amount of reverb, wet or dry, or delay time. The pretty colors are a spectrum analysis of the audio over time. All the controls can be automated with the envelope methods described in the previous section. When you are happy with the mix, its time to “render” the multiple tracks down to just 2 for stereo. You will still have the multiple tracks you started with, but a stereo mix can be made so you can share it or burn a CD. The RENDER window appears. Most of these options you should leave alone! Choose the part of the project you want rendered in the upper section marked source. Under Time Bounds, select “time Selection” If you drag across the numbers at the top of the project these numbers will fill in for you. Choose a name for the file in the File Name area. Browse for the location where you want the file to go – usually the project folder, but you may want it elsewhere. The important thing is to REMEMBER where you put it! Remember WAY back at the start of the class, all those boring numbers and file formats? Here is where they come in handy, and why. For CDs, choose a sample rate of 44100, and channels as stereo. Full-speed offline is fine. The output format should be WAV, but you can select MP3 or the other options. 24 bit PCM is what you want. For submissions to YouTube, Sound-cloud and the like, also use the .WAV format at 44.1, 16 bit. They will encode them when you upload to them. If you reduce the file size by giving them an MP3 it will be reduced further still in size, and sound odd. When you click “render” it will show a miniature version of the completed file. Look at it carefully. If the volume is too low, or high, or there is a big empty section at the start or end, you may need to make adjustments. You will learn to recognize visually mistakes. Jokes aside, you should definitely also listen to it to make any determinations. Some engineers will burn a CD and listen in several environments to make their final choices. You can choose to launch the file in your preferred music player, show in Explorer (Finder for Macs) or back. Until you close this window, you can do nothing else, however. In something with this many options, its natural to accidentally skip a few, but carefully looking at the various options and double checking the steps will usually reveal what you have done wrong. Most often its not putting a track into record, or into record monitoring. Always look and see if your recording is actually occurring after starting a recording. If it IS recording, a colored bar moves across the track. Reaper has an excellent built in manual, under help/documentation There are good tutorials on-line, and a manual on the class CD. There is a “quick start” that has all the main commands easily accessible. Look at the OPTIONS area to see if the various settings are correct. These are software simulations of actual synths. There are many that have no counterpart in hardware also. Here I added FX to a track that is a soft synth from Arturia called Analog Lab. It has dozens of sounds that can be modified via the controls shown here. This type of soft synth FX can also be played by clicking the keys with a mouse. In order to use this type of FX, simply “Add FX” as if you were adding reverb or other audio effect. To record MIDI to a track, first create a track. Then choose to “force” MIDI recording to make it a MIDI track. Choose the MIDI channel and device for input for the track. This will look different for each system depending on the equipment. Press the ARM RECORD button to the left of the track name. Pressing the keys should now show a red bar in the same place that incoming audio shows as a yellow bar, just to the right of the track number. 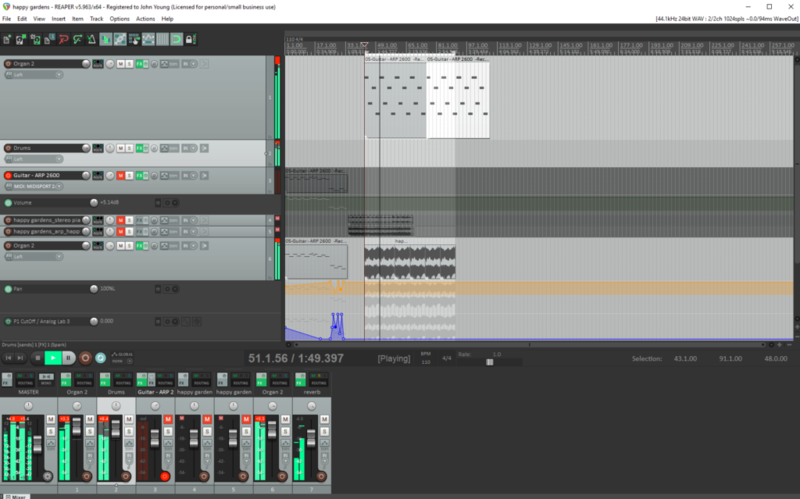 MIDI files, like audio files, can be dragged and dropped onto Reaper. A dialog box asks if the file should be expanded to multiple tracks. This is usually the best option. Once the MIDI file is imported each track is separate, and the instrument is labeled IF the original file has named tracks. This image shows tracks of the Zappa composition Zombie Woof. Reaper has only a few built in instruments. There are several here that I have purchased. When finished, render as previously. Multiple copies of the same VST can be used, set to difference sounds. If your computer bogs down, render them individually and import them. If you have a MIDI keyboard you can choose MIDI hardware output in the routing area. With MIDI, additional parameters can be automated just like volume and panning. Here is the automation section for Analog Lab. When you have multiple tracks with effects, it can become too much for a computer. One solution is to render individual tracks with the effects, then import that track into the project. Another way is to use SENDS to send ( hence the name ) a signal from several tracks at once to another track and place the effects only on that track. First create a track, and name it after the effect you want to use, in this case REVERB. Add a reverb effect to the track. Choose ADD NEW SEND, and select the track that has the effect desired. Since you named it REVERB (in this case) the name is right there. Choose how much to send to the effect track by moving the fader left or right. Play the music, and adjust as needed. You may send as many tracks as desired to this effect track, but it’s possible to send too MUCH signal to an effect track and overload it. The original track will still be heard as the “dry” version (no effect), and the effect channel volume can be adjusted.